(backposting) Two words which I almost begged the people doing my ultrasound to find an alternative to. Something medical-sounding. With "hepatic" in it, maybe, but no: everyone calls it "fatty liver", so that's what I'm going to have to tell friends and family. The good news is that it's entirely reversible, and is almost certainly down to my being a bit of a lardy *rse over the past few months. You _can_ be thin and have a fatty liver, but I'm not, and I do, so less fatty food, less alcohol, and more exercise. All the things that I know I should be doing anyway. It'll take a while to sort, but that's fine. In the evening, I attended James' installation as interim assistant priest at St Peter's, Bocking. It was a very moving service, partly because it's good to see James going into his first post after his title post (his curacy), but also because the parish is going through difficult times, and I think that James will be able to offer much to those associated with the parish. I sat, robed, with the other clergy, and it was great to feel part of a larger fellowship - not just Anglicans, not just men, Methodists and women, too. A very special evening. Surely the shallowest piece of programming in the history of TV. It has, in fact, no dimension of "depth" at all. At the same time, horribly, lethally compelling. I took Jojo to Gosfield church for the team service at which I was preaching today. It's the first time that I've had either of the girls with me when I've been involved with taking a service. She did very well, and Ashley, a girl in the choir was very kind in looking after her. I was so proud, and was close to tears as I walked up to the altar with the host, having just administered the host to a member of the congregation at the back. It's difficult to explain, but it was all part the thinking I've been doing about reverence and the sacraments. It's just such a privilege to administer the elements of the Christ's body. And I've been waiting so long for Jo to be able to join me at a service, and sit next to me as I used to sit next to my father. I preached about following Christ, and not just Jesus. I really care about this. If we just follow Jesus, we follow a man, and we deny the title that he earned by dying and rising for us. And if we call ourselves just Jesus-followers, and not Christians, then we deny the sacrifices - small and great - that others have made in the name of Christ over the ages, and that we make, and that our children will make. It is absurd to follow a man. It is maybe more absurd to follow a man who was God and man, and died, but it is right. We went swimming in the afternoon, and Jo swam for 10m in the big pool, all on her own. I think she could have done more, if she'd wanted to, and I was proud all over again. (backposting) Today was Jojo's first dance show: it was lovely. I cried at the end of her first appearance, I was so proud. I cried during the middle one, as I was nearly wetting myself with laughter. It was only a dress rehearsal, and was great. Jo didn't really get the fact that she should have been concentrating on remembering what to do, rather than (for instance) chatting to her friends or waving at me and Miri (or mouthing "where's Miri?" as she peered past the stage lights). Moo managed to see all of Jojo's four routines, I'm pleased to say. I even managed to get one of them on video on my phone. Everyone who sees it laughs, despite the fact that it was one of the less, um, shambolic routines. Miri managed the entire 2 and a half hours, and was a star. Oh - and in the morning, we watched Monsters vs Aliens in 3D, which was excellent. 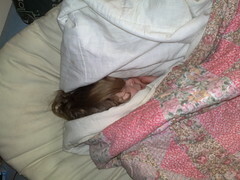 Miri slept through some of it, of course, but Jojo enjoyed, as did we. I'd strongly recommend it: it was very funny, and had enough adult bits to be diverting. I'm going to give the theology a break today - we're getting some more interesting comments, and I'll let those accrue before returning to it. The weekend's main excitement is Jojo's first ballet show. Officially tomorrow's show is a dress rehearsal, but Jo doesn't know the difference, and it's the one that Miri and I are going to (Moo's going to be backstage for a fair amount of it). It's all very exciting, and I suspect that Jo's going to be absolutely shattered by the end of it. So, thanks to everyone who responded to yesterday's post: I really appreciate the thought that people have clearly put into the comments. I've done some more thinking since yesterday, and the best way to explain some of that thought is to respond to some of your comments. James wrote: "When you did so [kneeling to lead prayers], you did it in front of the Altar, not because you were worshipping the wooden table, but because it was an appropriate focus for your worship of God." I find this interesting, because it's not why I did it at all. I knelt because I thought it was important to lead the congregation from a kneeling position, and I did it in front of the altar not because I saw it as an appropriate focus for my worship of God, but because if I'd knelt anywhere else, I would have been either hidden from view (by the altar) or separated physically from the congregation. I can see why you thought I knelt there, and I wonder whether other people thought the same. It doesn't bother me that they might, but it's not why I did it. Gary wrote: "Since the holy sacrament is the body and blood of our Lord, by definition we can (and should) pay reverence to it." I disagree. I think that we should treat it with respect, and possibly lean towards showing reverence towards it (to employ James' original definition at face value), but I think that they word "pay" is a give-away here. Reverence, in practice, isn't as clear-cut as the definition seems to suggest. The cross is an object to which we do not owe anything. We only owe anything to God, not to physical objects. The only exception might be the physical body of Christ, incarnated as a man, though he seems to have been pretty cagey about being treated specially, with the exception of washing and baptism, which are both actions which are extended to other people, too. That said, I realise that I'm somewhat conflicted about this: I treat the physical book which comprises Bible, at least within a worship setting, with great respect - almost as much as the sacrament. I think this, however, is because or the importance I attach to the Word (which is contained within the Bible and which the Lord's Body in the sacrament is, of course). This is a pretty protestant position, I'd argue. Sam talked about using icons as an aid to worship, and pointed to a useful blog entry about Corpus Christi. I agree on this: and we have a set of Stations of the Cross in our church. My father's very attached to various sets that he knows or has, and I find some of the images helpful for meditation and prayer. I'm not, however, attached to the Stations of the Cross as a specific thing, in the same way that I've used prayer beads in the past, but am not attached to them as a specific process or requirement. I genearally agree with the post about Corpus Christi, and I like the way Sam discussed the shift in emphasis of the phrase "corpus verum". Sally bemoaned the lack of symbol in her tradition. I find symbology very useful, too, and wouldn't want to lose it. It's when the symbols are used as more than that that I get unhappy, because I see this as a move to sacramentalism: moving beyond the sacraments to regarding objects as having a sacramental power. The reason, I think, that the bread and wine are special is that, as part of a sacrament, they are the body and blood our Our Lord. The Bible is special (and I still find it difficult to see people writing on a Bible!) because it's the Word: God's working in this world through the agency of the Holy Spirit. KT suggested talking to the PCC. I don't think this is needed, to be honest. I'm not worried about the legality of the service at all, and have already discussed my concerns about confession and absolution to my training incumbent (I'm in the first year of my title post, and not yet priested! ), who was very supportive. Neither am I worried about the service itself for general consumption (James has dealt very helpfully with the particular phrase that I picked up, and I acknowledge that his introduction is a good piece of guidance to the congregation), but what I'm trying to explore is how elements of the service - and, in many ways, the core assumption (now, _there's_ a word to reflect on...!) behind the service just doesn't fit with my theology. (I'd be interested to hear your situation, by the way, KT, if you'd like to share). I rather hope that this isn't the end of it. I'm really enjoying this discussion with you all, and making myself think. This, for me, is Reflective Theology (cue Gary turning up in a day-glo jacket), and is a Good Thing[tm]. I'm not trying to inflict my theology on other people (yet...), but I'm interested to see where I'm being led with this, and it's to a re-affirmation of the protestant underpinnings of my theology and my faith. May the Holy Spirit guide us all. During this service a crucifix is brought into the Church and we all have the opportunity to come forward in prayer and adoration. As the crucifix is brought in we proclaim "This is the wood of the cross" remembering that our crucifix is a spiritual help in contemplating the Cross of Christ. As we come forward we gently kiss the feet of our Lord and Saviour, or bow our heads, and give thanks for the tremendous gift of Christ who shared our humanity and suffered with and for us. The service uses the reserved sacrament, rather than consecrating on Good Friday: a practice which is traditional, and which I quite like (although I've previously enjoyed an ante-communion, where we start a service, and then finish it abruptly just before the eucharistic prayer). Unluckily, I have some major problems with the service theologically. The first two are easily dealt with: there is no confession or absolution before receiving of the sacrament. I'm very unhappy about this, but we're going to have a hymn with a confessional element, and I think we'll put in an absolution. [t]he first dictionary definition [of "veneration"] says "a feeling of profound respect for someone or something". Surely we can have profound respect for the representation of the cross because of what it represents. This is the wood of the cross, on which hung the saviour of the world. All come, let us worship. Now, maybe I'm being too critical, but it's not clear to me what the object of our worship is supposed to be. The obvious answer is that it's supposed to be the the subject of the preceding sentence: "the wood of the cross". I think that's a legitimate reading of the text, and if someone were to come to it with an unnuanced theology, then I think that might be what they thought was going on. And I don't believe that we should hold a cross as worthy of worship. Or any other object. Or anything other than God - the Father, the Son, the Holy Spirit, three in one and one in three. The veneration of the cross is an old tradition - and a catholic one. There's nothing wrong with that, but I feel that the liturgy that's been put together within Common Worship goes too far towards what I believe are the errors of (certain types of) (mainly Roman) Catholic practice. I know that I'm in danger of condemning practices which are very helpful for many people, and I'd stress that I enjoy ceremony and tradition and liturgy in many instances. But this feels like a step a little too far for me. It's made me think hard about other aspects of my worship - receiving a blessing before the Gospel reading (is it the book that's being blessed, or the reader and the reading? ), kissing my stole before putting it on (is this to allow me to reflect on the responsibility I am taking on, or veneration of an object?) - but I think that's a good thing. In many ways, I'm a reformation protestant - or Reformation Protestant - but I need to understand how (and whether) that can be reconciled with more recent theological insights. I see all of this as part of my growth and development as a minister: I appreciate comments and thoughts. And prayers, of course. Today we had confirmation that Certicom, the company for whom I work, had been acquired by Research In Motion. I was in two minds about this when things started, but I'm feeling more and more happy about the move, and we had an all-hands meeting/presentation with some of their execs tonight (though I missed some of it as I had to take a baptism preparation), and I was pretty impressed. Some of my initial reservations were around the old Blackberry I had about 3 years ago, but I'm hearing good things about their recent products and I like what I'm hearing about the company. It certainly remains to be seen where I fit into things, but we'll see. (backposting) A few weeks ago, I reflashed some of the roof. This is a technical term for putting special sealant on bits that might be leaking. Sure enough, it stopped the leaks. Most of them. At around 2315 this evening, one of the leaks did. Big time. Time to call out a professional tomorrow. Moo didn't have as good a Mothering Sunday as I'd have liked. There were cards and a pressie from the girls, but I had to do the 0800 and the 1000, and as Miri had been sick in the night, I didn't expect them to come. And in the afternoon, she spent 3 and a half hours at a dance rehearsal with Jo. She spent some nice time with the girls, though, and we're currently watching The Wire season four. Liverpool beat Aston Villa 5-0. This takes us to second in the Premiership behind Man. U., and ahead on goal difference. Jade Goody died. I preached on this. She wasn't a perfect woman, by a long way, and many people had real issues with her, and fair enough. But she taught us something about facing death with honesty, and about how to make provision for your children. People are now talking about cancer - nasty cancers, in fact - and about baptism. And about how to die. These are all good things. I compared her with Mary, mother of our Lord. I think that's fair. It must be spring, because I cleaned and then used the barbecue for the first time this year. I'm not a loony "if I can stand outside and not be blown over or drowned, I ought to be barbecuing" type person, but I do like to get barbecuing when the weather's warm enough. It's been a lovely day, though I had to go back to bed again as I was so tired this morning (and grumpy): Moo very kindly took the girls while I took another 2 hours. Still tired now. This may be connected with the medical condition that we're investigating at the moment. We took the girls to Clare Country Park this afternoon with their bikes. Now that Jo has her own, Miri has her old one, and was beginning to get how it worked by the end. A lovely day - and though it was warm during the day, we now have a fire lit. I spent about 6 and a half hours in the car today, driving to Basingstoke and back. It was pretty quick on the way there, but the M3 and the M25 were both terrible on the way back. Gave me plenty of opportunity to make some calls (on the hands-free, though I was actually at a standstill for annoyingly large amounts of time). The meeting was a good one, however, and worth the trip, so that's good. The other piece of news is that I've heard that RIM, whose acquisition of us is due to get final approval on Monday, have announced that they're going to give everyone a Blackberry. I see this is as very good news, as it suggests that they're not intending to do an immediate and wholesale "asset strip" (e.g. sacking lots of people). And I know, now, that they're aware of my existence, as well, as they offered me the option of keeping my current number or getting a new one. I don't yet know what phone it will be, and have received lots and lots of differing advice from friends. I got a decent sized external hard drive for Christmas, but never got around to setting up backup to it. I had some time today, and finally got round to setting up rsync and crontab. Two very useful apps that I should have got round to nailing a long time ago: sensible additions to my armoury. Oh, and it's official: we got acquired, subject to the court's approval. Who knows what this means jobwise: we'll just have to see. This evening I took a Lent course session, around 25 people, from various local churches. It was entitled "Forgive, forget? ", and we tackled lots of really thorny questions. People got really engaged, and it was really good: I really enjoyed myself, though there were some difficult issues to be dealt with. I had a couple of blood tests past week, and then had a letter from the surgery to come in for an appointment. I had that appointment with the doctor today, and he had his serious face on. So, more tests, but actually, even if it's what he thinks it might be, though it's interesting, it's not a major concern. More to follow: nothing to worry about, but prayers always welcome! "Yarn Addiction": an state in which a person becomes so engrossed in yarn-based activities that he/she is unable to interact with the outside world. Affects: knitters, spinners, dyers, weavers, etc. If you have a partner, spouse or relative who is a frequent - or recovering - Yarn Addict, then you are welcome to this (Facebook) support group. It was a good, honest day. Two Spanish-related stories today. The first is that at church this morning there was a Mexican couple who it turned out were visiting Essex for their daughter's graduation for her doctorate from Essex University (sociology). They spoke some English - particularly the wife - but not huge amounts. I speak a little Spanish (understanding more than I speak), and invited them to sit next to me and Miri (Jo was at home with Moo, having been sick this morning, though she was well enough to go to a dance rehearsal in the afternoon). I managed to feed them bits of information through the service, and was particularly pleased that I managed to use my phone and The Bible Gateway to allow them to follow the Gospel reading in Spanish. They were very friendly and we had a lovely chat in Spanglish after the service over coffee, and I hope they'll be in touch by email. The second story revolves around the TV programme "Come Dine with Me" on Channel 4. One of the contestants was using chorizo sausage in a recipe. She mispronounced the word. And then the presenter mispronounced it. At least twice. I'm thinking of starting a campaign. Look, it's really, really simple. In Italian, the letters "ch" are pronounced "c" (as in "consonant"). And the letter "z" as "ts", as in "it's". In Spanish (Castillian, at least), the letters "ch" are pronounced "ch" as in "church", and the letter "z" as "th" as in "thin". "Chorizo" is a Spanish word. It is pronounced "Ch-o-r-ee-th-o". And NEVER, EVER, EVER, EVER "Ch-o-r-ee-ts-o". If it were Italian, it would be "C-o-r-ee-ts-o". It's not. It's Spanish. I've corrected my sister-in-law on this once, and it went very, very badly, but the truth is important. And I'm not going to let it lie. Oh, no. After a lovely meal with Jim, Nina, Poll, Lee, Florence and Frankie, we popped to Sainsbury's to do some shopping. At the end, Jo said she needed a wee, so I took her off to the toilets. The gents were frankly disgusting, and rather than doing the sensible thing and taking her into the disabled toilet, I accepted Jo's suggestion that she should go into the ladies. I stood outside, noting people going in and coming out: there was always someone in there at the same time. After a few minutes, I heard, "Daddy? Daddy?". I opened the door a couple of centimetres, and said "yes?". "Daddy, my croc has come off." "Just put it on later." I closed the door. Another minute or so elapsed. "Daddy? I need help with my poo." A laughing teenager opened the door and suggested I come in, which I did, and waited outside the door while Jo insisted finishing some more of her poo. A woman came out of the other occupied cubicle, laughing at me. In the end, Jo let me in. The ladies' emptied, and I tried to chivvy Jo on, to no avail. Another woman came and entered a cubicle. "Shhh," I said as quietly as I could to Jo. "Why? Why do you want me to be quiet?" "Shhh!" The other person finished, and left, and I thought we were clear, but another woman came in and occupied a cubicle. Jo finished, and again I thought we were clear, but she took ages to get her pants (two pairs?) and tights up: and just as we were unlocking the cubicle door, there was a flush from the other cubicle. I have literally never washed my hands and ushered a child out of a toilet quicker. Moo laughed like a drain. "O Lord, remember not only the men and women of good will, but also those of ill will. But do not remember all the suffering they have inflicted on us, remember the fruits we have bought, because of this suffering - our comradeship, our loyalty, our humility, our courage, our generosity, the greatness of heart that has grown out of all of this, and when they come to judgement, let all the fruits we have borne be their forgiveness." Moo brought the girls back from playing at a friend's house, and Miri had fallen asleep in the car. 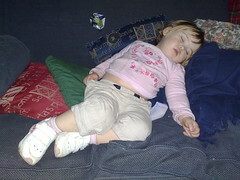 Very, very asleep: to the extent that neither of us could wake her. Luckily, after 40 minutes of sleep, Jo's additional volume did the job. (backposting) So we went out for lunch to the White Hart in Great Yeldham. We had a good meal and I discussed my health whilst browsing wikipedia on my phone, looking for illnesses from which I may be suffering. Now that the gout has started to subside, my most serious complaint is a dangerous and acute form of masculine hypochondria. This debilitating condition could have derailed the important time we spent together on Moo's birthday - special time for her - but luckily she's able to laugh at me. Not just able, it seems, but more than willing to do so. She'll soon learn better if my condition worsens, I can tell you. (backposting) we decided today that Jo needs more stimulation, so as she's really getting reading proper words (and digraphs such as "sh" and "ai"), we offered to let her read a complete book. Moo had bought some in the "jolly phonics" series, and Jo managed to read 2 of them. She needed help, and it was slow, but she read every word on her own! What a star. Go Liverpool (2-0 up (3-0 on aggregate) at halftime). And what I thought might be a broken foot turns out probably to have been gout (or pseudo-gout). Embarassing, somehow. I think that I may have broken a bone in my foot. I'm not sure when, but it's been hurting all day. I had a look at it this evening, and it's not looking good. This is kind of funny, but kind of annoying, particularly as I've got lots of driving to do tomorrow for work. (backposting) It was James' last day with the team today: he's been the "senior curate" since I arrived in the team, and he's been a source of wisdom and support over that time. And he's become a good friend, too. We saw him off at a 1000 service, and he also came to an informal "TECS" service that I ran at Earls Colne at 1800. Oh, and there was a lunch: he gave me a bottle of single malt, which I intend to ensure that he helps me drink. The TECS service was interesting and fun, though I made a bunch of mistakes in the running of it (no grace, 1 wrong hymn, 1 hymn so badly formatted that it couldn't be read, stuff like that), but I played Lisa Gerrard's "Sanvean - I am your shadow" and Keane's "Again and again", which both seemed to go down very well. James I and finished the day with a drink at the Dog Inn in Halstead. We'll be keeping in close touch. Jojo is just fantastic when she's good, but can be a real nightmare when she's not. This morning, I was trying to convince her to come upstairs to get dressed so that she could go to ballet with Moo. She wanted to say downstairs and watch TV, so I came downstairs and calmly asked her to come upstairs, at length. In the end, I had to pick her up (gently, gently), and carried her upstairs. When we got there, she turned round to me, screamed in absolute rage, and pushed me away. She's never done that before, to me or Catherine. It was the rage, and the open-mouthed scream. And the rejection. I was tired (in fact, I was about to go back to bed, as I'd been low on sleep _before_ Jo had us up at 0515), and that's part of the reason I cried, but it was horrible. Moo comforted Jo, and Miri came straight over to me and gave me a lovely cuddle. She's a real Daddy's girl at the moment, and it was lovely that she came over. But it was hard. Once a month, we have a team communion service which aims to be informal - but orthodox - and it's my turn to come up with it for Sunday. It's been significantly harder worth than I expected, but I've got something ready now. I needs a little more work, but the outline's there. Basically, I need to come up with a short talk/sermon, and may be some pictures to accompany it. James will be relieved to discover that after around 45 minutes playing around with photo-editing software, he's not going to appear on the projection screen as Pope Benedict XVI or some random cardinal. Back by popular demand, and this time it's "how to get your PC to talk to your dad's old hard drive as a second drive so you can get the data off it". The other way to do it, if the "new" machine isn't a laptop, is to open it up and connect the hard drive to the machine using the relevant connectors inside it, but this may not work for various reasons (including lack of relevant cables), and is introduces some risks. The other, other way is to ask a geeky friend to do it for you. If you trust your geeky friend, if they don't charge too much, and if you're happy that there's no confidential information on it. I had a CME course evening on marriage preparation days today, which was interesting. I went into it with a great deal of cynicism, but willing to be convinced, and I pretty much was. It was well led, and had some really good discussion, including from a member of clergy who happens to be divorced, and I've got lots to think about. A meal with the clergy team today, our last meeting before James goes. He'll be missed. In a good way. He's become a very good friend. (backposting) I went to London to an (ISC)2 conference on content security. It was interesting, and there was some good discussion, too. Did some good networking, too, with some useful people. Tried calling HQ as I was heading back - difficult to raise people at the moment. But I heard that things are moving. (backposting) The girls to see us, and we to see the girls. They'd had a lovely time with Kate and Mac, and they (Kate and Mac) survived. Moo took them out to an indoor play centre in the afternoon, and I had a sleep (after a bad night last night). We left them after supper, and drove the girls home: they both woke up on our arrival, but it didn't take long for them to drift off again. (backposting) It's not that often that we get to sleep in, but I was up and dressed by 1106, which isn't too bad. Not that much later for Moo. We had a lovely meal at The Punchbowl, and then headed up to The Wool Clip, where Moo bought some wool (one lot at my suggestion, as I hope she's going to use it to knit something for me). Then back to the cottage to finish off the 2nd series of The Wire. What a great programme. When we phoned the girls, Miri said "I miss you, too" in response to me. It's lovely when they learn to speak properly.